The sun's corona can only be seen during a total solar eclipse. 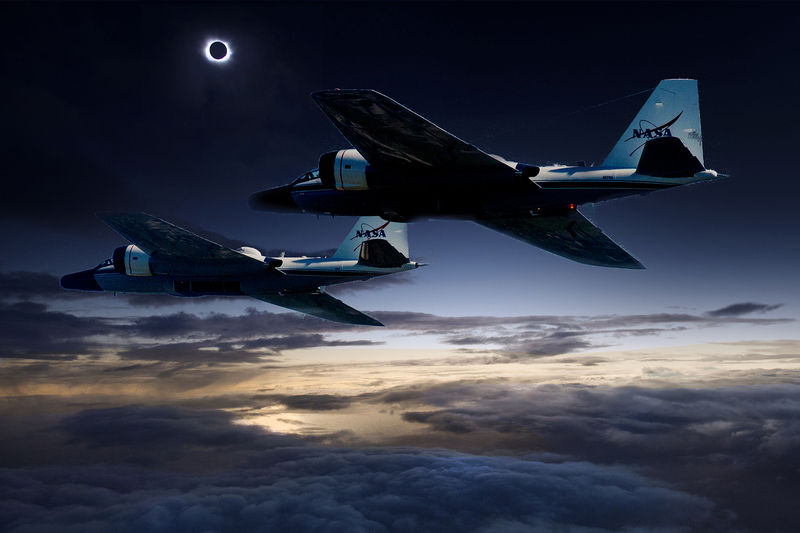 A total solar eclipse will slash across the U.S. on August 21, and NASA will be there, chasing its cosmic shadow in high-flying jets. The eclipsed sun will give NASA scientists a rare — though brief — opportunity to study the sun’s vast, million-degree atmosphere, or corona. The ultra-radiant sun is one million times brighter than the corona, making the wispy atmosphere nearly impossible to see. But during a total solar eclipse, the moon completely obstructs the sun, exposing a spectral stellar atmosphere that scientists know little about. NASA’s two WB-57F research jets, fitted with telescopic cameras on their noses, intend to watch from 50,000 feet. NASA prepares a WB-57F Jet for some eclipse chasin'. The jets will race inside the moon’s rapidly moving shadow for three and a half minutes each, giving NASA a chance to view the corona for seven minutes. For most of us, confined to the ground, the eclipse will last about two and half minutes. While inside the shadow, the cameras will capture 30 high-definition photographs per second. Up at 50,000 feet, the jet cameras will be above a majority of Earth’s atmosphere, giving NASA clear views of the corona’s ghostly wisps. The sun’s corona is still quite a mystery. It behaves in unpredictable ways that can have devastating impacts upon our infrastructure, so scientists want to foresee these looming events. The corona constantly blows a solar wind, comprised of highly charged particles, into space. At unpredictable times, it will send out a powerful burst, and these charged waves can wreak catastrophic impact upon our electrical grids. The National Academy of Sciences predicts that a massive solar wind event could paralyze the eastern seaboard, wiping out power for a year. 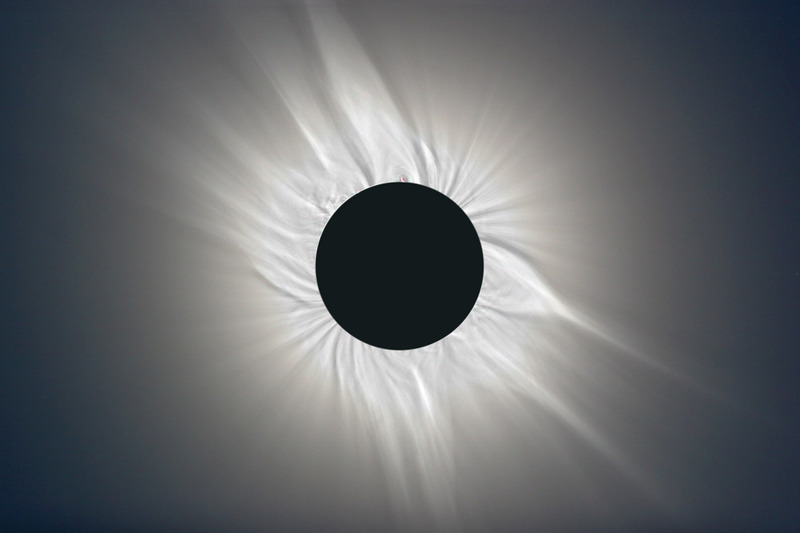 The sun's spectral corona, seen during a total solar eclipse. What’s more, while much of the corona is millions of degrees in temperature, the surface of the sun is dramatically cooler, at just a few thousand degrees. Scientists cannot yet explain this odd phenomenon, but believe these high-altitude observations might allow them the see mircoexplosions from the sun’s surface, or nanoflares, which could inject massive amounts of heat into the corona. NASA’s investigation of the sun’s corona won’t end on August 21. Next year it will launch the heavily-armored Parker Solar Probe into the outer corona, which only gets a few thousand degrees in temperature. A massive 8-foot diameter shield will protect the probe’s instruments from the scorching sun, and like NASA’s jets, perhaps provide insight into the usually invisible, mystifying corona.